Us adjunto un dels nombrosos impactes mediàtics assolits. De fet, tant en mitjans de comunicación com en xarxes socials hem aconseguit un moviment enorme. Estem contentíssims. Ja comencem a preparar el màgic repte de les XXV Jornades del Cable i la Banda Ampla a Catalunya-2020. 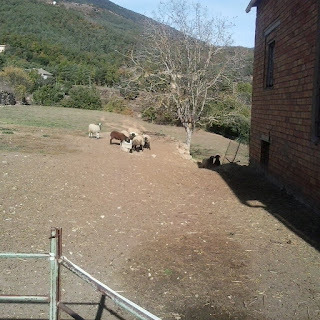 Seran 25 anys i ho celebrarem d'allò més! ¡En pocos días ya llegan! 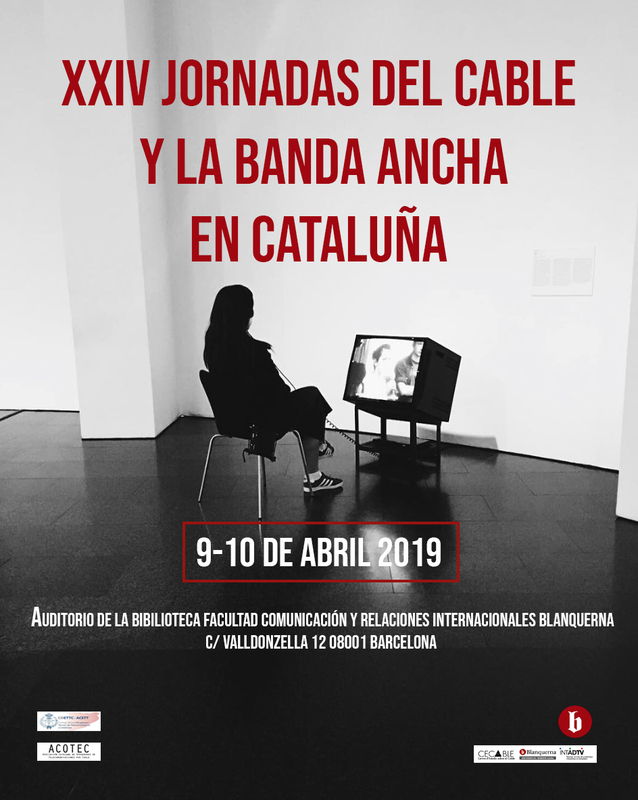 Sí, el 9 y 10 de abril el HbbTV (Hybrid broadcast broadband TV), el cable y la banda ancha gobernarán el debate científico de las XXIV Jornadas del Cable y la Banda Ancha en Cataluña-2019, organizadas por el Centro de Estudios sobre el Cable (CECABLE), Blanquerna-UniversitatRamon Llull (incluyendo al grupo de investigación INTADTV) Colegio Oficial de Ingenieros Técnicos de Telecomunicación de Cataluña (COETTC) y Acotec (Asociación Catalana de Operadores de Telecomunicaciones por Cable) en el Auditorio Blanquerna de la Universidad Ramon Llull, en el centro de Barcelona. El HbbTV refleja la necesidad de un flujo de banda ancha generoso y, a poder ser, garantizado. La Sociedad de la Banda Ancha y el Cloud Journalism se sintetizan en este estándar interactivo que se está expandiendo internacionalmente y que concede el control a las cadenas de televisión, en contraste con un Smart TV en manos de los fabricantes. 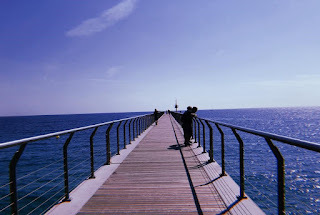 In the next post of the blog, we will expose the reality of broadband in Badalona, thanks to the study conducted by Indira Caballero, from UPF. Nowadays, broadband has become a reality in Barcelona due to technological advances. Many municipalities have access to different internet networks to download information and create content, but not all of them carry out the same telecommunication plans. In the developing article we will analyse the implementation of broadband in the town of Badalona, belonging to the district of Barcelonès. To begin with, it is essential to define the concept of FTTH (Fiber To The Home). The telecommunications technology consists of the use of fiber optic cabling and optical distribution systems for the provision of Triple Play services (Internet, Telephony and Television) to households, businesses and companies. In addition, FTTH technology allows surfing the Internet to more than 2 Gbps. Nowadays we live in the Broadband Society, in the kingdom of information. This means that all the structure and social, economic, political and culture relations are based in the implantation of new technologies of information and communication (ICT). The municipalities receive the advantages of broadband, like Girona with its tourism, analyzed with Clara Mendoza Sanz, from UPF. Broadband takes an important place in this connected world of the XXI century, and we can even talk about the concept of the broadband society. Our generation is constantly looking for an instant access to a wide variety of information and communication wherever we are: when we travel, in the streets or at home. It has become our religion, like tourism. Tourism, broadband and social media, always together. 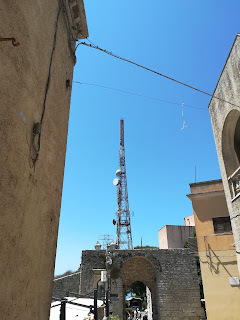 We will analyze the Italian broadband in collaboration with Filippo Picerno. 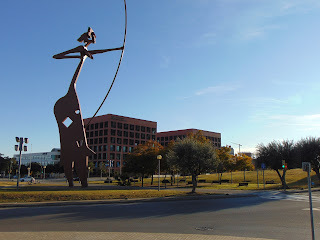 Italy is linked to Internet and the fist steps of the Broadband Society since 30 April 1986 when the first “ping” message was sended with a computer in Pennsylvania to the Cnuce (“Centro nazionale per il Calcolo Elettronico”) researchers in Pisa, Italy is the fourth country in the world linked to Internet. Afterwards the World Wide Web (WWW) birth by Tim Berners-Lee in 1991, in Italy was founded an organization called GARR (“Gruppo per l’Armonizzazione delle Reti deal Ricerca”), its work is to link the major universities and research centers of the country. The telecommunication world has been constantly changing during the last years thanks to all the technological advances that have been appearing in our Broadband Society. Because of that, all the network infrastructures needed to improve to be as actualized as the digital world, and also to have the possibility to offer the best and fastest service. So, all these developments need more bandwidth to let the user be able to have access to these new applications and contents, with less download times and more appropriate costs. This is the reason why the broadband development became one of the main purposes of many countries in the world, such as has happened in Spain. The country connected to the Internet for the first time on 1990 and since that moment, theinformation technologies have been constantly evolving and improving. In the present article we analyze, with Laia Calaf Navarro from UPF, the broadband evolution in the concrete case of Gavà, one of the biggest towns from the Baix Llobregat county. 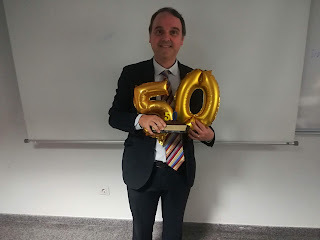 ¡Muchas gracias por los 50 millones de páginas vistas del blog! ¡Muchas gracias a todas y a todos por los 50 millones de páginas vistas del blog científico Telecomunicaciones y Periodismo! Es emocionante alcanzar cifras como esta, y también el homenaje por sorpresa recibido en la Universitat Pompeu Fabra, que agradezco de corazón. Se trata de un éxito de todas y de todos, ya que el autor cuenta con numerosos colaboradores (individuales, empresas y entidades), seguidores y lectores que configuran una estimulante comunidad para analizar y debatir sobre la Sociedad de la Banda Ancha y el Cloud Journalism. During a lot of years, great efforts have been carried out to provide this Catalan region with great connection facilities in the Broadband Society. During the first years of the 21st century, broadband arrived to Catalunya, but often in a non-regular way. 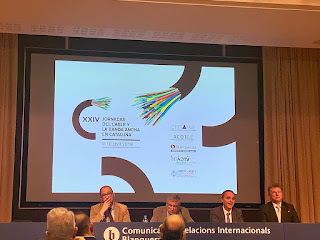 For this reason, in 2003, during the rise of Internet and communication technologies, the local government, the Generalitat of Catalonia, launched the program ‘Catalunya Connecta’. 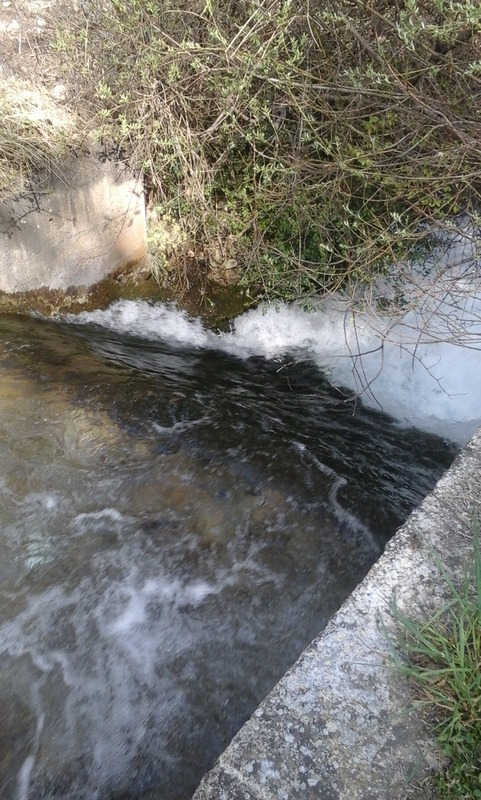 A plan that intended to provide access to the new communication technologies - including broadband - to the Catalan territories, especially within the rural areas. 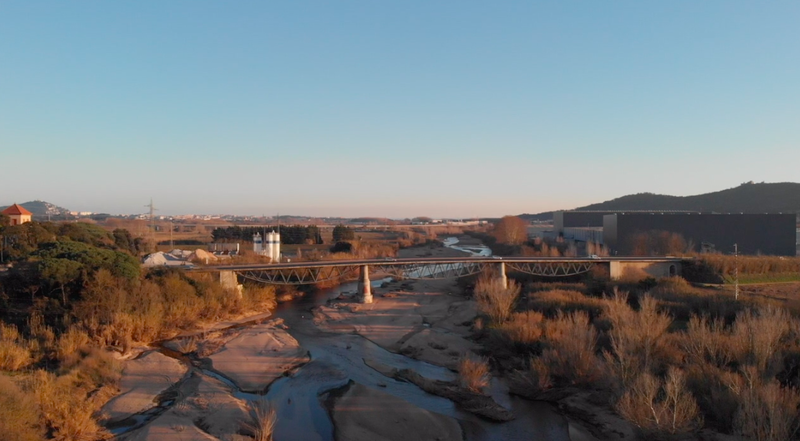 We analyse it in, focused in the Lleida’s reality, essential for tourism, in collaboration with Lluís Tomàs Bassa, from UPF. Broadband is increasing in all European countries; this is also the case of Catalunya. Broadband Society axioms are the universalizations of the service and a guaranteed broadband flow. But, is this broadband network available at the same level in urban and rural areas? We analyze it with Ariadna Coll, from Universitat Pompeu Fabra (UPF). 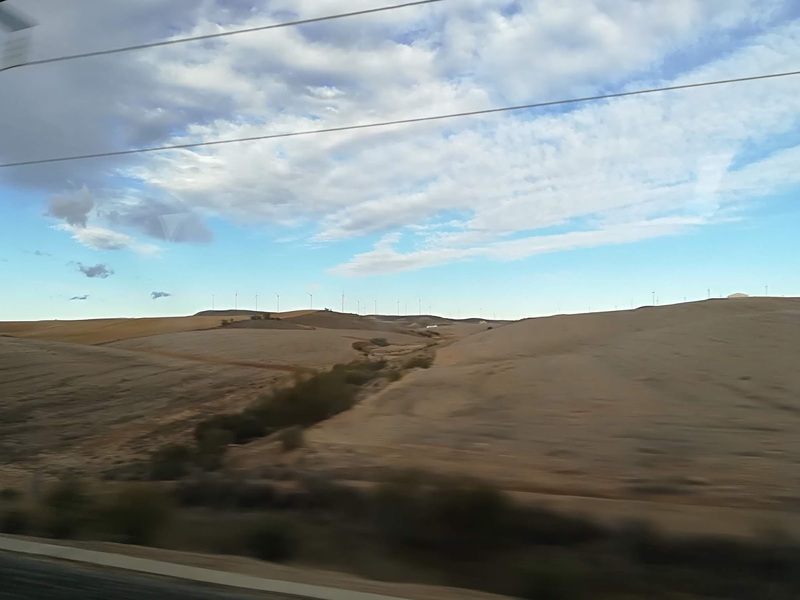 One of the latest broadband news that Catalunya received was on September 19 of 2018, published by El Periódico. “Catalunya tightens the accelerator in the ultrafast internet access”. With this title El Periódico explains that Catalunya has stood out in the last years in comparison to other autonomous communities. Broadband Society is essential for all the municipalities. We will analyze the case of Mataró, with Oriol Agramunt, from Universitat Pompeu Fabra. The capital city of El Maresme has had 95% of broadband penetration for the last 4 years. Nowadays European citizens live in the Broadband Society, but it is also true that there is a wide range of broadband penetration depending on the area the people live. The same happens in Spain and Catalonia.